Do you know how many teeth your dog or cat has? Do they have a normal healthy bite? To evaluate the bite and determine if it is correct, you need to know the number of teeth and their normal alignment. The number of teeth and the correct alignment is discussed below. 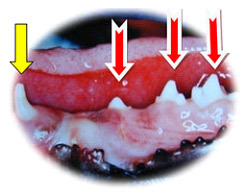 The majority of dogs have a ‘scissor’ bite. In some breeds, such as the Old English Sheepdog, the incisor alignment is level, which is referred to as a ‘level bite’. In other breeds, the lower jaw (mandible) is excessively long – this includes Bulldogs, Boxers, Shih Tzu, Tibetan Spaniels, plus a few others, this is termed ‘a reverse scissor’ or brachygnathic jaw realtionship. It can also be termed a Class 3 malocclusion. The opposite, where the upper jaw (maxilla) is excessively long, termed a ‘parrot mouth’ or Class 2 malocclusion, is abnormal in all breeds and has been deemed a genetic problem in some lines of Rottweilers. 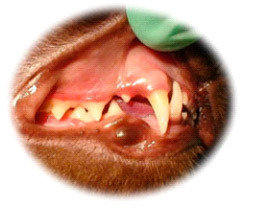 All puppies with a normal scissor bite should have 28 deciduous (baby or milk) teeth. These include three incisor teeth, one canine tooth and three premolar teeth in each of the four jaw quadrants: maxillary right, maxillary left, mandibular left and mandibular right. 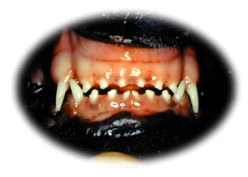 A scissor bite when viewed from the front shows twelve incisor teeth and four canine teeth. The incisor teeth number six in the maxilla and six in the mandible – you can also count three on the maxillary right and 3 on the maxillary left, then 3 on the mandibular right and 3 on the mandibular left. The canine teeth are positioned one in each jaw segment – maxilla and mandible, left and right – these are the pointy fang like teeth on the edge of the picture. The canine teeth are positioned one in each jaw segment – maxilla and mandible, left and right – these are the pointy fang like teeth on the edge of the picture. When viewed from the side, the correct position of the mandibular canine tooth is equal distance between the maxillary incisor and canine teeth. 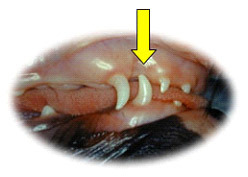 The yellow arrow is positioned to show the mandibular canine tooth. 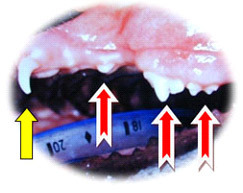 When the maxilla is viewed from the side the canine tooth (yellow arrow) and three premolar teeth (red arrows) are visible. 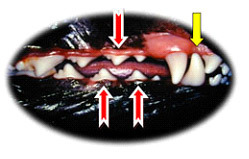 When the mandibleis viewed from the side the canine tooth (yellow arrow) and three premolar teeth (red arrow) are visible. All adult dogs with a normal scissor bite should have 42 teeth. 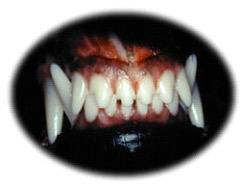 When viewed from the front a normal ‘scissor’ bite shows a total of twelve incisor teeth and four canine teeth. There should be six incisor teeth in the maxilla (three are on the right and three on the left of the midline) and six in the mandible (again three are on the right and three on the left side of the midline). The maxillary incisors overlap the mandibular incisors. The four canine teeth are positioned one in each jaw segment – maxillary right, maxillary left, mandibular left and mandibular right. When viewed from the side a normal ‘scissor’ bite shows the incisors, canine tooth, four premolars and molars (from right to left). Note the mandibular canine tooth (yellow arrow) fits equal distance between the maxillary third incisor and canine teeth. Also notice the interdigitation of upper and lower premolar teeth (red arrows). Adult cats have 30 teeth consisting of three incisor teeth, one canine tooth, three premolar teeth and one molar tooth in each of the right and left maxilla, and three incisor teeth, one canine, two premolar teeth and one molar tooth in each of the right and left mandibles. Their normal occlusion is classified as a scissor bite similar to dogs but with a slight difference. 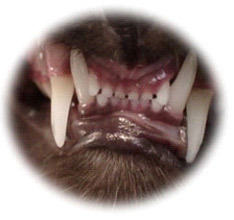 The upper and lower incisor teeth normally align similar to dogs, with the maxillary incisors slightly overlapping the mandibular incisors. In some breeds, such as the Persian, the incisor alignment is level, which is referred to as a “level bite”. Normal canine and premolar teeth relationship. The mandibular canine is positioned between the maxillary canine and third premolar teeth. The upper jaw is wider than the lower jaw. The upper premolars interdigitate with the lower premolars. This alignment allows the shearing of food. All of the cat’s teeth have pointed tooth crowns.